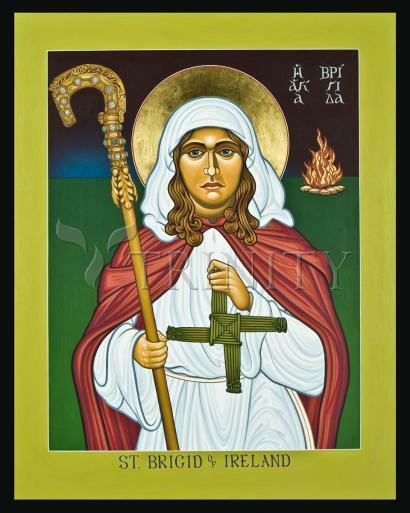 Most revered of all of Ireland’s early female saints, Brigid was born of pagan\\Christian parentage, and raised in the fosterage (early Irish practice of youth education) of a druid. She converted to Christianity at age 17. Noted for her prayerfulness, compassion, humility, and generosity, she founded the earliest known Celtic double monastery, housing both men (renowned for a school of art in illuminated manuscripts) and women (expert in wool industry and weaving of cloth). She professed a profound belief in “anam cara,” or soul friends, unique persons God offers us as companions on our pilgrim road. This extended to the idea that love and intimacy were essential to a sound marriage, also quite unique for her time. Exceptional in another aspect, St. Mel of Ardagh, inebriated by her virtues or by ‘spirits’, ordained her a bishop and she was respected as such. A perpetual fire was kept in her honor from her time till extinguished by King Henry VIII’s order in 1540 of the Dissolution of Monasteries. Recently it has been rekindled. In this icon she is noted for her beauty, holding the crosier (based on the famous Lismore crosier), symbolic of a Bishops staff and shepherds of men. Her clothing is the fine wool work of her sisters. She also holds a ‘Brigid Cross,’ an ancient solar symbol traditionally made to welcome Spring (Feb.1, in Ireland). Dawn barely touches the sky over her right shoulder, a time when the veil between worlds is very thin, and her perpetual fire burns through the night. Also known as ‘Brigid of Kildare’ (“Kildare”= church of the oak) and ‘Bride’ (“bright or exalted one”). Her feast day is February 1. Brigid was probably born at Faughart near Dundalk, Louth, Ireland. Her parents were baptized by St. Patrick, with whom she developed a close friendship. According to legend, her father was Dubhthach, an Irish chieftain of Lienster, and her mother, Brocca, was a slave at his court. Even as a young girl she evinced an interest for a religious life and took the veil in her youth from St. Macaille at Croghan and probably was professed by St. Mel of Armagh, who is believed to have conferred abbatial authority on her. She settled with seven of her virgins at the foot of Croghan Hill for a time and about the year 468, followed Mel to Meath. About the year 470 she founded a double monastery at Cill-Dara (Kildare) and was Abbess of the convent, the first in Ireland. The foundation developed into a center of learning and spirituality, and around it grew up the Cathedral city of Kildare. She founded a school of art at Kildare and its illuminated manuscripts became famous, notably the Book of Kildare, which was praised as one of the finest of all illuminated Irish manuscripts before its disappearance three centuries ago. Brigid was one of the most remarkable women of her times, and despite the numerous legendary, extravagant, and even fantastic miracles attributed to her, there is no doubt that her extraordinary spirituality, boundless charity, and compassion for those in distress were real. She died at Kildare on February 1. The Mary of the Gael, she is buried at Downpatrick with St. Columba and St. Patrick, with whom she is the patron of Ireland. Her name is sometimes Bridget and Bride. Her feast day is February 1.